Changes in technology and musical demands have contributed to the creation of a new phenomenon, the SECOND TRANSITION PERIOD (1970- present). This article seeks to provide the reader with additional information concerning instruments and bows from the Transition Period with particular emphasis on the Second Transition Period and the changes wrought by the change from gut to high-tech strings, the invention and refinement of carbon-fibre bows and instruments and last but certainly not least, the great strides in terms of research and development in authentic performance practice. The Classical period in music history was characterized by structure, balance and harmony. Following the impulsive tendencies of the Baroque age, composers such as Haydn and Mozart reaped the benefits of two hundred years of musical richness and experimentation. At the outset of the Classical period, luthiers relied on their modus operandi during the Baroque Period that involved the use of a small, thin bass bars and a significant amount of pressure on the belly of the instrument. The combination of heightened pressure on the top with a small bass bar provides the leading characteristic of the Transition violin: well articulated, penetrating and somewhat straightforward in sound. It was not until the 19th century that various technological changes dictated the use of a thicker, larger bass bar that was able to balance increased pressure on the one hand and provide additional material support on the other hand. Thus in terms of instrument and bow-making, the Classical period was not an age of structure, balance and harmony!! Turning to bow making, the Classical period can be referred to as a Transition Period during which the Baroque bow made way for the ‘Cramer’ bow (named after the famed violinist Cramer) circa 1770. Within three decades the transition Period came to an end with Tourte’s development of the modern bow. A half-century would pass before 18th century instruments would undergo the modernization process. 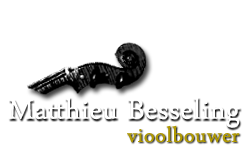 J.B. Vuillaume was the most important luthier in this process. Countless old Italian instruments were re-built in his workshop. Larger, more massive bass bars replaced their smaller counterparts and longer, diagonally placed necks replaced the Baroque models. 2. The development of carbon-fibre bows and instruments. 3. The transition from analogue to digital sound recording . 4. The demand for larger and more penetrating sound on the part of both soloists and orchestral musicians. In the larger orchestras, players have been forced to sit behind sound protection screens and use state-of-the art earplugs when the screens have not offered sufficient protection. Earplugs are a growth market and hearing damage is commonplace for older string players. In the past, violinmakers answered to the demands of their market, the needs expressed by string players. Today’s experts often make thin bridges and sound posts and create modern instruments that can play loudly to meet the demands of the contemporary market. 5. The norms of ‘perfect’ playing promoted and promulgated by the recording industry have spawned countless young talent searches and competitions. Stress replaces personal performance standards and to attain this artificial level of perfection, performers often rely on Beta blockers. The final consequences of this Second Transition Period are yet to be discovered. Criteria to judge the phenomenon are being discussed and developed at the present time. The old Italian instruments were considered to be better suited for transformation and ‘re-building’ into ‘modern’ instruments than Stainer model instruments. This resulted in a significant price increase for the old Italian instruments and the concurrent depreciation of the Stainer models. If today’s violin shops would take the challenge and amplify instruments electronically than perhaps the loudest violin, the best amplified model, might well be the most expensive instrument! Nowadays, volume and fast response (the instrument’s playability) are often considered to be more important than sound quality as we have come to know it from the old Italian instruments. The establishment of the Second Transition Period has led directly to the creation and promulgation of authentic performance practice as it relates to music from the first half of the 20th century. From daily experience, I have observed that string players arrive at my studio full of questions concerning adjustments with a focus on a ‘new ideal sound’ with an emphasis on loudness. Thin bridges and sound posts, synthetic and/or high-tech strings are all examples of what modern players crave. I am not quite sure if the high string angle placed over the bridge results from a Second Transition phenomenon: K. Leonard suggested that the ideal angle should lie between 157-161 degrees (Mittenwald, 1967) whilst 154-155 degrees was taken as the ideal at the Oberlin workshops (Oberlin, Ohio, USA) in 2004. Frequency characteristics of the violin have been studied by many experts and expressed in terms relating to sound production by the ‘the human voice’. Desirable, round sounds characterized by the vowels o, u and a have been juxtaposed to the edgy sound characterized by the sounds i,e, and s. A harmonious mix of these sounds in which i,e, and ns are less prevalent than the round vowel sounds (o,u,a) is the sound ideal discussed in leading tomes on the subject. If one compares the tonal range of the violin to the registers of the human voice, we can develop formant characteristics akin to what Winckel achieved using the d’Egville Guarneri del Gesu in 1967 (see Graph nr. ). The ideal ‘great old violin’ model has a large amount of u, a and o sounds (for roundness) and enough i,ns, s and e sounds for projection and brilliance. The ‘new sound ideal’ prevalent in modern instruments and the demands placed upon these instruments in the Second Transition period increases the total amount of volume disproportionately in terms of the high frequency ranges (i, e, and ns) juxtaposed to the lower ranges. If the string angle is high, the percentage of nasal, edgy sounds (i, e and s) is also high. 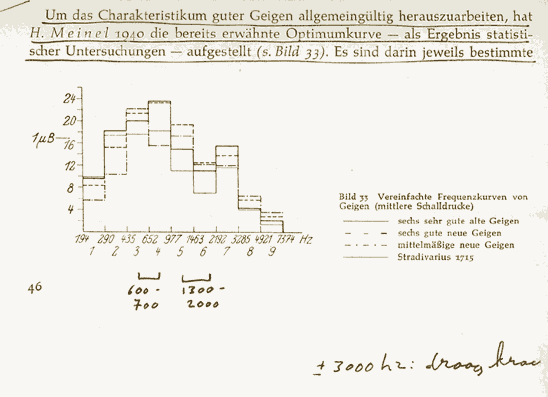 If we compare the ‘new sound ideal’ to H. Meinel’s frequency curve charted in 1940 developed to differentiate between good and less good instruments in terms of tone, it appears that the ‘new sound ideal’ moves in the direction of the less desirable instruments in Meinel’s curve. Meinel chose a sampling of six excellent old violins plus one Stradivari instrument to compare to six good new models and six inferior violins. The worst violin in Meinel’s table shows more i,e, and ns and less round vowel sounds than the Stradivari example and the tests on the six good old violins. The new sound ideal so prevalent in the music world since 1970 moves toward the i, e, and ns characteristics at the expense of the cherished round sounds. Thus the graphic representation prepared by Meinel over sixty years ago is reflected in the sound of modern instruments!! Subjective listening proves the point as well: many instruments regardless of whether they have been newly built or adjusted to suit this ‘new sound ideal’ are louder, sharper and less round in sound quality. Should the contemporary violinmaker go with the prevailing fashion or does he/she have the obligation to educate today’s players? As long as modern practitioners value the greats of times gone by (Heifetz et al.,), violinmakers still have a chance to explain the value of ‘the old ways.’ Interestingly enough, wind instruments have witnessed a similar developmental pattern, however that discussion goes beyond the scope of the present article. * A raised to 435 – 440.